Streaky, from the cover of Action Comics #334 (March 1966). Art by Curt Swan and Sheldon Moldoff. 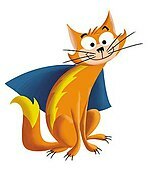 Streaky the Supercat is a fictional character that appears in comic books published by DC Comics. Streaky first appeared in Action Comics #261 (February 1960) and was created by Jerry Siegel and Jim Mooney. Streaky the Supercat first appeared in Action Comics #261 and was created by Jerry Siegel and Jim Mooney. One of a series of super-powered animals including Krypto the Superdog, Comet the Superhorse, and Beppo the Supermonkey that was popular in DC's comics of the 1960s, Streaky was Supergirl's pet cat that was given super-powers by an unusual form of kryptonite. In Action Comics #261 (February 1960), Supergirl was experimenting on a piece of green kryptonite in an attempt to find a way to neutralize its deadly effects. When her experiment failed, she tossed the kryptonite (or "X-Kryptonite", as it became known) out the window. Though her experiment failed, her pet Streaky came across the X-Kryptonite and was exposed to its radiation. As the comics described it, "Due to the unique combination of chemicals in X-Kryptonite, it has given Streaky superpowers!" Streaky's powers consisted of a smaller subset of those of Superman and Supergirl, including flight, super-strength, super-vision, super-speed, heat vision, and human-level or better intelligence. Streaky made sporadic appearances in comic stories through the 1960s, and even became a member of the Legion of Super-Pets, a group consisting of the aforementioned super-powered animals. Streaky's last pre-Crisis on Infinite Earths appearance was in Adventure Comics #394 (June 1970). When all of Earth's kryptonite was transformed into iron in Superman #233 (January 1971), Streaky's X-Kryptonite power source was eliminated as well, ending his super-career and returning him to the life of a normal housecat. In an answer to a reader's letter in Supergirl #2 (January 1973), editor E. Nelson Bridwell confirmed the elimination of X-Kryptonite and that the now-powerless Streaky had gone to live with Linda (Supergirl) Danvers' foster parents in Midvale. During Grant Morrison's run in Animal Man, an alternate, grey-furred Streaky (which left an orange contrail with the telltale lightning bolt marking) made a brief appearance in issues #23-24 (May–June 1990) as one of the pre-Crisis characters that were returned to reality by the Psycho-Pirate's Medusa Mask. This alternate Streaky attacked "Overman," an evil parallel universe Superman with his heat vision before being hurled out of the asylum. Presumably, this Streaky vanished from existence when the Psycho-Pirate's episode of madness ended, along with his human counterparts. Various cats inspired by and sometimes named Streaky have made appearances in the post-Crisis DC Universe, but none so far have acquired superpowers. In Peter David's Supergirl vol. 4 series, a particular cat named Streaky, identical to the pre-Crisis version, jumps from a tree as if trying to fly before being saved by Supergirl and returned to its owner, saying the town of Leesburg is not "ready for a flying kitten." The cat appeared in issues #25 (September 1998) and #42 (March 2000). At the 2007 New York Comic Con, when asked if Streaky would be returning, writer Paul Dini said that the "cat’s out of the bag." In Supergirl vol. 5 #10 (November 2006), it is revealed Kara has a female pet cat. In issue #14 (April 2007), it is revealed that the cat's name is Streaky because "she doesn't get the concept of the litter box." During the Final Crisis, Streaky is first seen in Supergirl's apartment as Supergirl urges her not to pee in the laundry. After the escape of the Anti-Life Equation, Supergirl takes Streaky to the Fortress of Solitude. Supergirl #38 (April 2009) establishes that, when Supergirl began sharing an apartment with Lana Lang as "Linda Lang", she took Streaky with her. When Supergirl moved to New Krypton, Lana looked after the cat. Streaky's first appearance post New 52 and DC Rebirth was in Super Sons Annual #1. This version has traits of the Pre and Post-Crisis versions as Streaky is female but has the powers the original. Streaky was a member of the Legion of Super-Pets (consisted of Krypto, Titus, Flexi the Plastic-Bird, Bat-Cow, and Clay Critter), but the group had a falling out when their battle against Dex-Starr, Bud, and Lou resulted in Clay Critter's death. Krypto and Titus reunite the group to stop an alien pet thief that's been kidnapping the city's dogs. She is also implied to have a crush on Krypto despite blaming him for Clay Critter's demise. Streaky has a 30th-century descendant named "Whizzy" who first appeared in Action Comics #287 (April 1962), and was created by Jerry Siegel and Jim Mooney. A lookalike for Streaky, Whizzy is an orange cat with white lightning-bolt markings on either side of his body. Supergirl first encounters Whizzy, who wears a red cape like his ancestor, when she answers a summons from the Legion of Super-Heroes in the 30th century. After defeating the Positive Man, Supergirl is addressed telepathically by a flying cat she assumes is her pet Streaky. She observes, "You have a 'W' insignia on your cape instead of an 'S'! The engraving on your collar explains everything!" True enough, emblazoned on the cat's collar is the following legend: "Whizzy, descendant of famed supercat Streaky." The effects of the battle with the Positive Man, (defeated by use of a Negative Bird) have caused the Legionnaires to seemingly lose their powers. Supergirl covers for the team, but they betray her. She and Whizzy are tossed into the Phantom Zone. While in the Zone, Supergirl learns the de-powered Legionnaires are really an invading race of "Chameleon Men". Whizzy assists in the escape from the Zone. The invaders are defeated and the heroes are rescued from their asteroid prison. As well as appearing in comics related to the Krypto the Superdog cartoon, Streaky appears in Supergirl: Cosmic Adventures in the 8th Grade. He has a cameo in issue #3 (April 2009), but it is in issue #4 (May 2009) that he is given superpowers by being exposed to an electrocuted piece of kryptonite that Supergirl had discarded. He leads Supergirl under her school where she helps him free her fellow students. Then he takes off into space vowing to return as he has found something out about Supergirl's teachers. He returns in issue #5 (June 2009) where he saves Supergirl by taking a blast from Belinda Zee's Bizarro vision. He is transformed into a Saber-toothed cat. With the second blast of this vision he reverts to a normal cat. He spends the rest of the series hissing at the bad guys, insinuating his intelligence has remained, but the powers and ability to express himself has gone. Streaky has appeared in DC titles Super Friends and Tiny Titans. In Super Friends #14 (June 2009), he helps the other super-pets save the world when humanity is immobilised. In Tiny Titans, he attends pet club meetings with Supergirl and the other super-pets. In Superman Family Adventures #2, Streaky encounters Fuzzy, the Krypto Mouse for the first time. A version of the character appears in Supergirl's Wednesday Comics strip along with Krypto. The story was written by Jimmy Palmiotti and drawn by Amanda Conner. One scene of the Batman: The Animated Series episode "Deep Freeze" had a group of robotic toys that resembled the comic book characters Bat-Mite, Mister Mxyzptlk, and Krypto the Superdog, and one of the toys resembled Streaky. In Superman: The Animated Series, Streaky has made a few appearances as an ordinary housecat of the Kents. As an inside joke in the episode "Mxyzpixilated", Mister Mxyzptlk demonstrated his powers by making Streaky fly around the room. In the Justice League episode "Comfort and Joy", J'onn J'onzz does not feel the Christmas spirit until he wanders around Smallville. He meets Streaky near the beginning of the episode, beckoning him to come over by saying "Kitty", at which Streaky hisses and runs away. At the end of the episode, he is seen in true Martian form, petting Streaky while singing. Streaky as he appears in Krypto the Superdog. In 2005, Streaky became a main character on Cartoon Network's animated series Krypto the Superdog voiced by Brian Drummond. In this series, Streaky once again has superpowers, and is the pampered pet of Krypto's owner's next-door neighbor, Andrea. In the series, Streaky goes into a lab where he crashes into a duplicator laser. The laser shoots Krypto and bounces off him and into Streaky, giving him powers similar to Krypto's. Unlike the original comics version, who was immune to the effects of kryptonite radiation, this Streaky does share Krypto's vulnerability to green and red kryptonite. A Kryptonian cat with identical coloration to Streaky appears in the Legion of Super Heroes animated series in the episode "Message in a Bottle." This version of the character is a native to the shrunken city of Kandor. When Brainiac 5 turns the Kandorian sun from red to yellow, this 30th Century "Streaky" analogue receives superpowers. In an episode of Batman: The Brave and the Bold, Streaky is shown in a TV advertisement that the Blue Beetle is watching. The commercial is promoting "Plastino's Cat Snacks". Al Plastino was the artist who drew Streaky's owner, Kara Zor-El's first appearance. Streaky the Supercat appears in the "DC Super-Pets" sketch of DC Nation Shorts voiced by Debra Wilson. Streaky the Supercat appears in Justice League Action episode "Unleashed", helping Krypto the Superdog battle against Dex-Starr of the Red Lantern Corps, voiced by Jason J. Lewis. Streaky has made appearances in The CW's live-action series Supergirl. He is depicted, however, as a solid black cat and possesses no super-powers. Kara describes Streaky as a stray cat she found not long after arriving on Earth. She fed him every night and learned to be gentle with him despite her Kryptonian strength. Kara felt like an alien on Earth until Streaky helped her feel like a human. In 2011, Capstone Publishers began publishing a series of DC Super-Pets books illustrated by Art Baltazar. Streaky stars in Royal Rodent Rescue written by John Sazaklis and drawn by Baltazar. Two different Streaky plush toys have been manufactured. ^ Eury, Michael (2006). "Jim Mooney Interview". The Krypton Companion. Raleigh, North Carolina: TwoMorrows Publishing. p. 44. ISBN 1-893905-61-6. Streaky the Supercat was my design. I think the writer came up with the initial idea, but I designed him so he looked a little bit more like an animated cat. ^ Smith, John W. (February 24, 2007). "NYCC, Day 2: DCU, A Better Tomorrow - Today". Comic Book Resources. Archived from the original on June 17, 2011. Retrieved February 12, 2012. ^ Renaud, Jeffrey (July 15, 2009). "Wednesday Comics: Jimmy Palmiotti". Comic Book Resources. Archived from the original on October 7, 2012. Retrieved October 7, 2012. Streaky and Krypto are acting a bit weird and taking the city along for the ride. ^ Trecker, Jamie (August 20, 2009). "Wednesday Comics Thursday: Amanda Conner Brings the Cute". Newsarama. Archived from the original on October 7, 2012. Retrieved October 7, 2012. ^ Dini, Paul, Timm, Bruce (writers); Altieri, Kevin (director) (November 26, 1994). "Deep Freeze". Batman: The Animated Series. Season 2. Episode 19. Fox Kids. ^ Dini, Paul (writer); Riba, Dan (director) (September 20, 1997). "Mxyzpixilated". Superman: The Animated Series. Season 2. Episode 8. Kids' WB. ^ Dini, Paul (writer); Lukic, Butch (director) (December 13, 2003). "Comfort and Joy". Justice League. Season 2. Episode 23. Cartoon Network. ^ Evans Gardner, Jennifer and Loy, John (writers); Jeralds, Scott (director) (April 6, 2005). "The Steaky Story". Krypto the Superdog. Season 1. Episode 3. Cartoon Network. ^ Kuhr, Joseph (writer); Jeralds, Scott and Vietti, Brandon (directors) (December 1, 2007). "Message in a Bottle". Legion of Super Heroes. Season 2. Episode 8. The CW. ^ "Your Live Superman Radio Show - Radio KAL Live!". Superman Home Page. September 20, 2016. Archived from the original on October 23, 2016. ^ Damore, Meagan (January 15, 2018). "SUPERGIRL JUST GAVE KARA A SUPER PET (SORT OF)". Comic Book Resources. ^ Montgomery, Paul (July 8, 2010). "Art Baltazar Unleashes DC Super-Pets Line of Children's Books". iFanboy. Archived from the original on October 7, 2012. Retrieved October 7, 2012. ^ Sazaklis, John; Baltazar, Art (2011). Royal Rodent Rescue. Mankato, Minnesota: Capstone Publishers. p. 56. ISBN 1404866221. ^ "Streaky the Supercat plush toy". Mego Museum. 2011. Archived from the original on March 14, 2014. ^ "DC Comics Super-Pets! Dex-Starr and Streaky Plush Figures". DC Comics. December 2015. Archived from the original on November 6, 2015. You can take your pick with these new, fun plush figures of Red Lantern Atrocitus’s furball Dex-Starr and Supergirl’s faithful pet Streaky the Super-Cat! Korte, Steve; Baltazar, Art (2013). DC Super-Pets Character Encyclopedia. Capstone Publishers. p. 128. ISBN 978-1479520305.